Add Pantropy to your wishlist and don´t miss the launch! 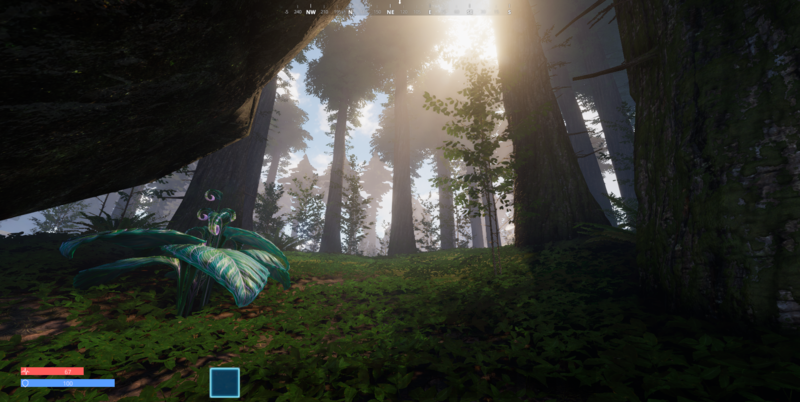 We have been working a lot on performance, bugs and gameplay improvements. Julian has further polished the AI, improved turrets and fixed many bugs and performance issues. 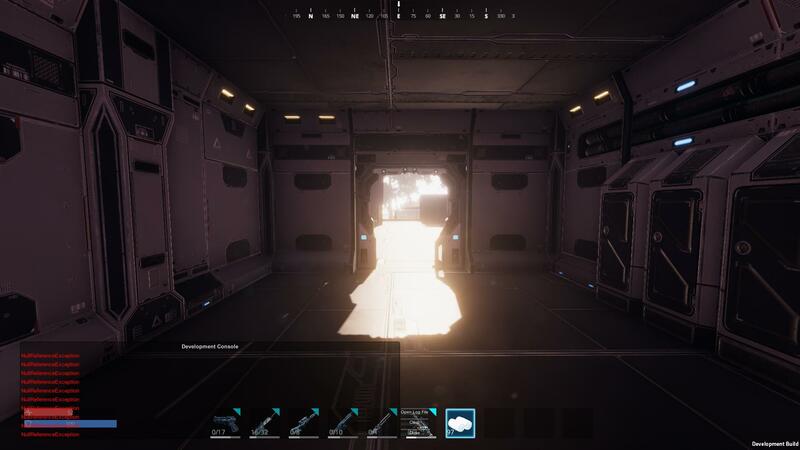 Turrets have less of a performance impact now. We have added a warning sound and a laser pointer. Mobs are less glitchy and no longer fall through the ground. We have added a value-based crafting and item system. All processed materials have a specific value and can be refined in order to raise this value. 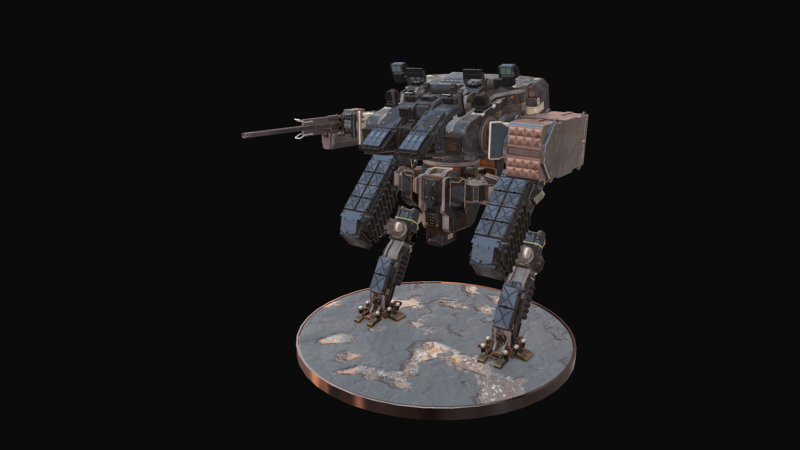 The quality and stats of your mech, tool or weapon depends on the value of the crafting materials that you´ve used. This affects your mech, weapons, tools, base parts, generators etc. Besides that we have also introduced android NPC traders. You can buy and sell almost everything from these guys. We´ll soon place more „shops“ in the world which will open new possibilities for traders. Go and grind your stuff or simply buy it. Be a trader! If you have the cash you can also buy into the black market where you can buy high level items. You can buy all items in different kind of qualities from the stores. 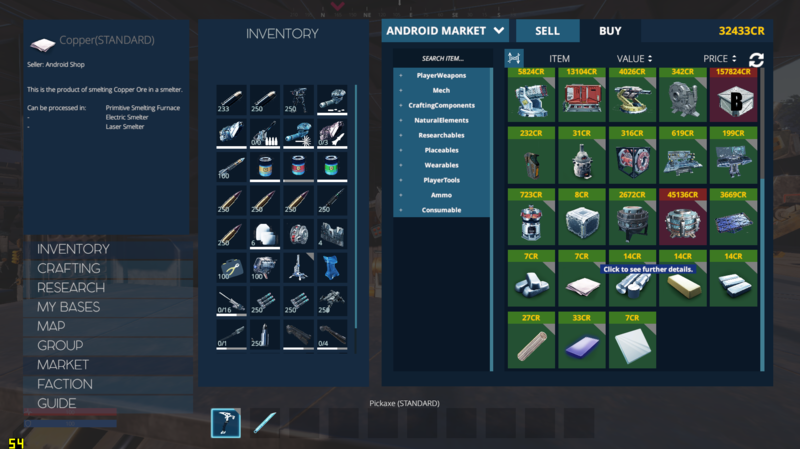 Just to be sure : I want to mention again that this is ALL ingame economy and you can´t buy anything using real money. There are no microtransactions! Another new feature are memory discs. Once you kill an enemy faction player you´ll be able to loot his memory disc. This is more or less worth depending on the player´s playtime and when he last died. Those can only be sold on the black market. 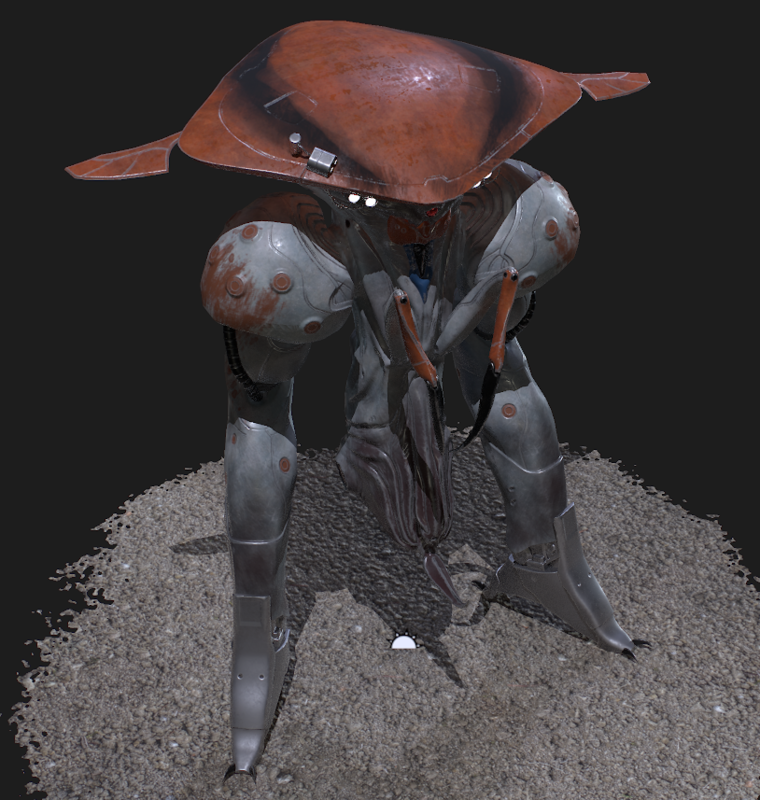 Anjar has finished the second boss model and started working on the alien faction melee runner. 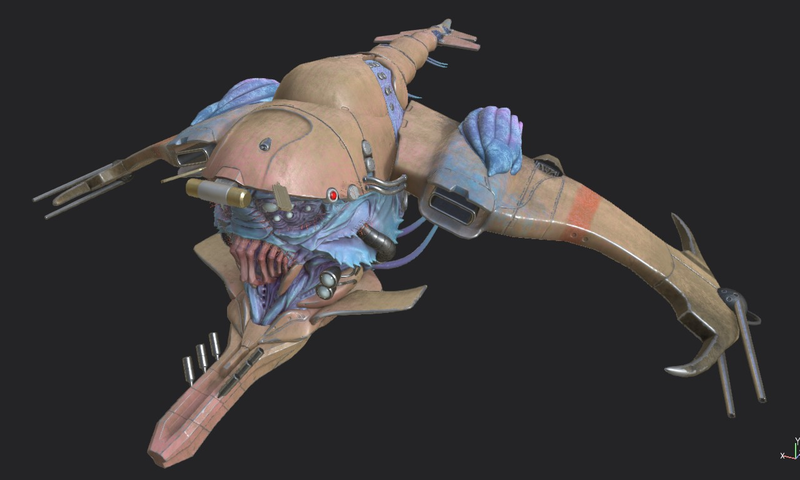 I really hope we can have big swarms of these guys. 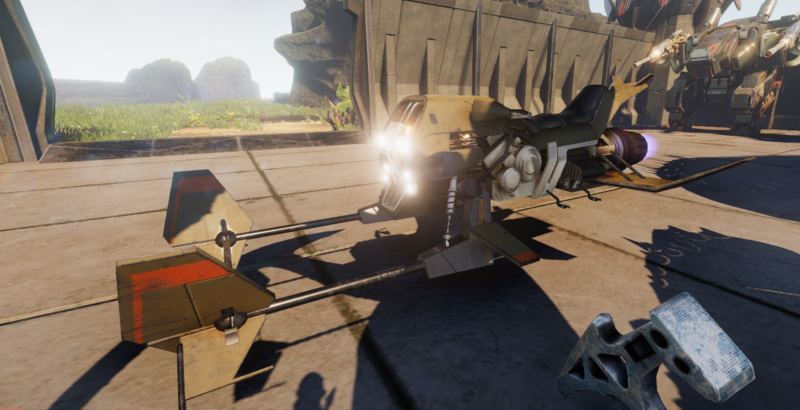 He has also finalized the speeder. 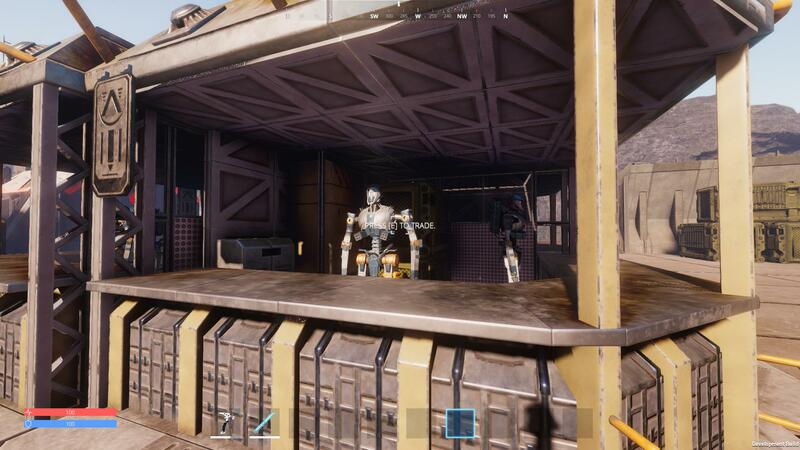 Artem and his team worked on the new POIs and finished the mech hangar and the large storage building. The large storage building might contain a lot of loot. But beware the turrets. 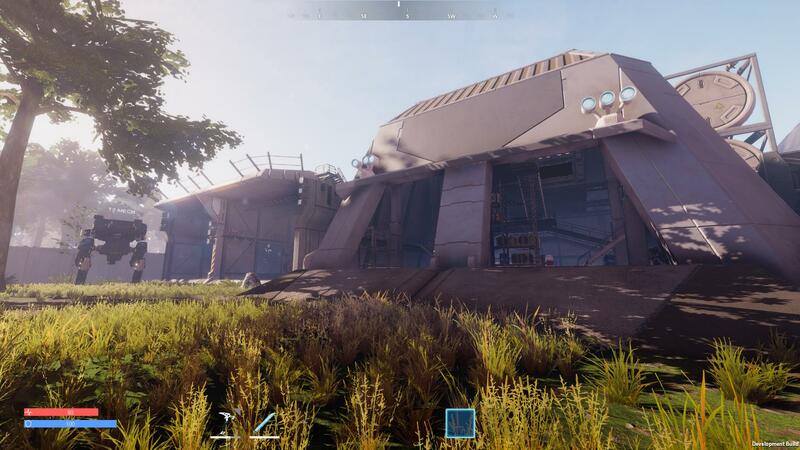 We´ll soon re-design all outposts and also expand the size of the faction HQs. 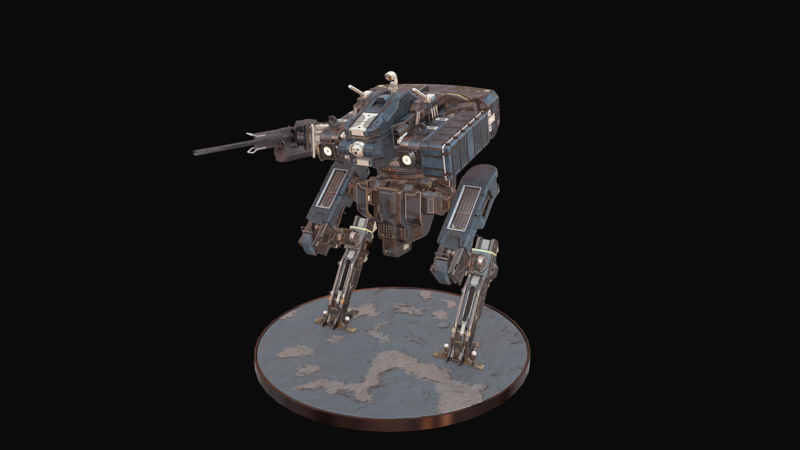 Alex and Alexey have finished the lowpoly models of the modular T2 mech system. 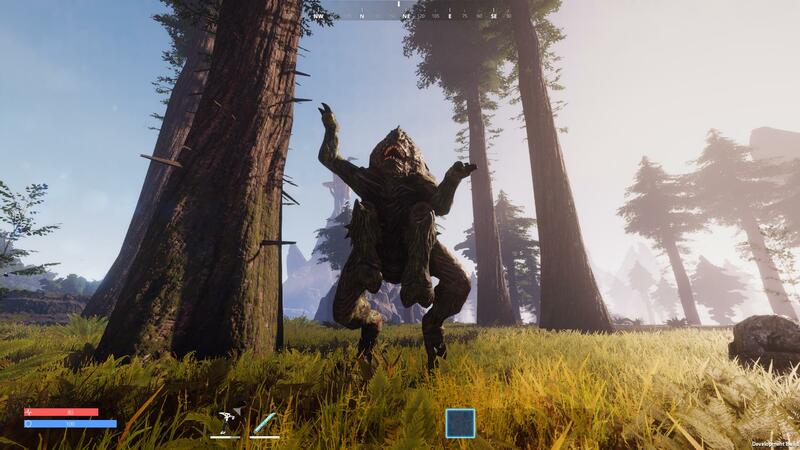 I don´t think they will make it into the game before release though. Light T2 legs and torso. Heavy T2 legs and torso. The enviroment has received another huge update. 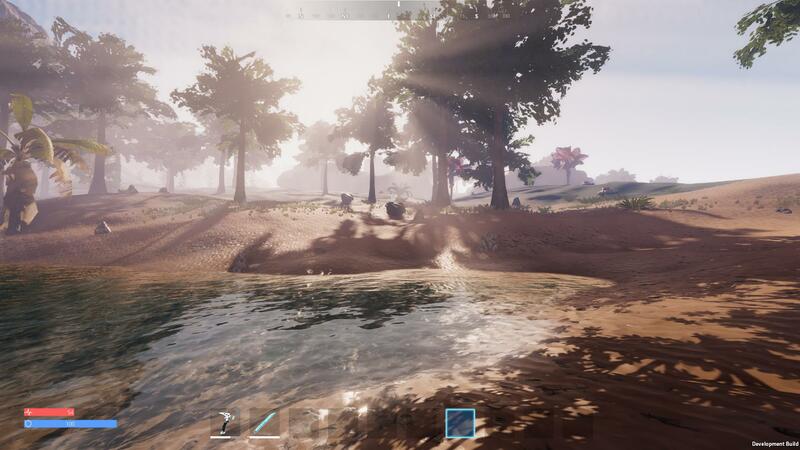 We changed the shaders of the water and rocks, added new grass types, replaced all trees and added a new forest biome. The water and rocks now look less spectacular but we managed to boost the client performance a lot. The water is a tad more simple but has almost no performance impact anymore. We have also changed the day and night cycle, clouds and set a nice foundation for an upcoming weather system. We have started working on caves and new POIs. 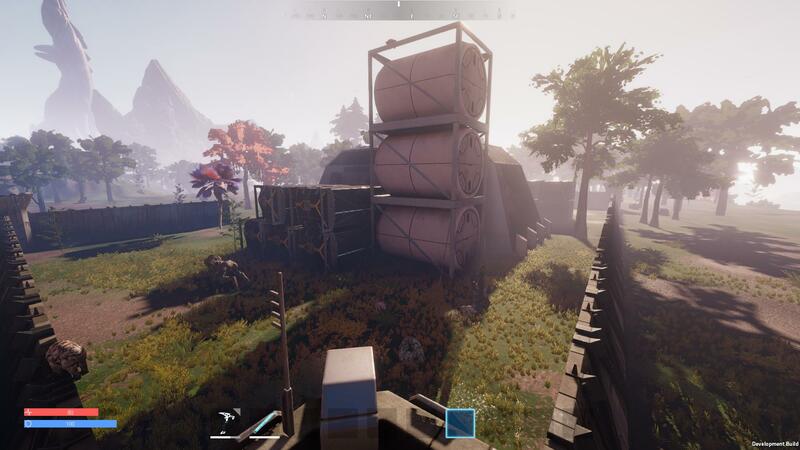 You can already find 2 new large bases on the map that can be looted. 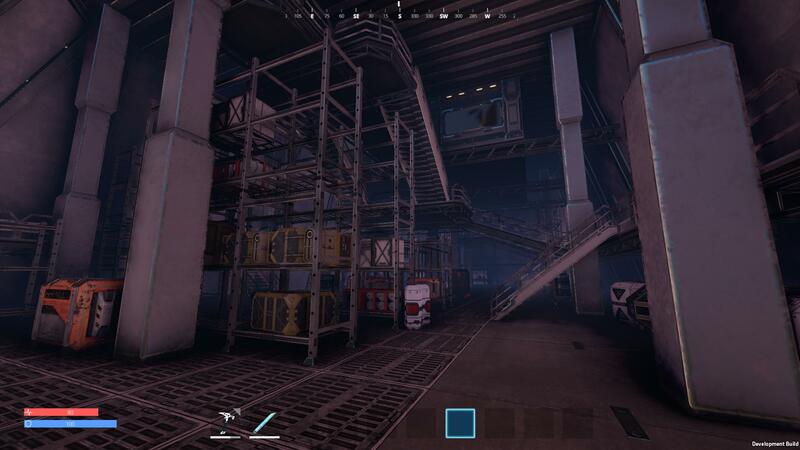 The inside of the mining station is filled with loot and other dangerous things. For the upcoming weeks we´ll focus soley on client and server performance improvements, bug fixes and gameplay balancing. 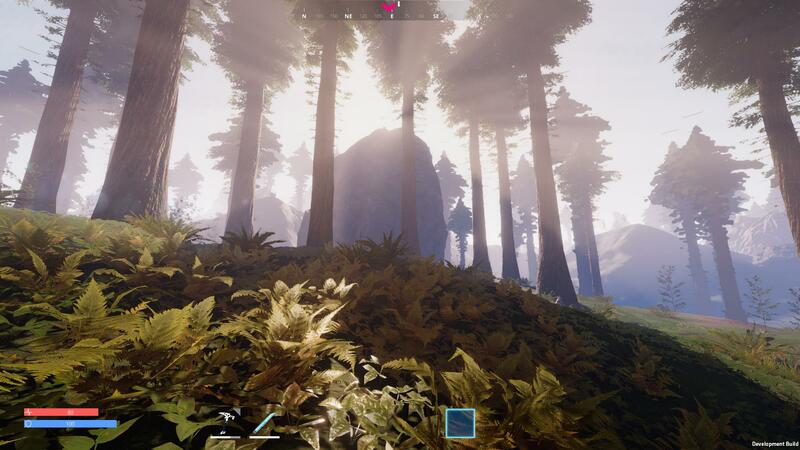 We also have to take new screenshots, a new trailer and update the whole website and steam store page. Join our Discord for regular updates! We´re going to have a community event on the upcoming sunday, 6 pm UTC. Join our Discord for more details! Awesome! 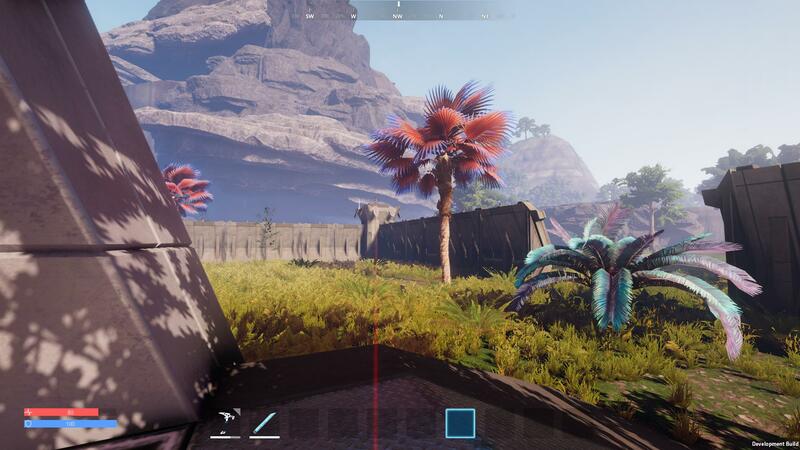 The environments look amazing! Love the new models as well. Any plans for a Linux version in the future? Keep up the amazing professional work!